The sound, which amazes with its dynamics, spaciousness and natural performance. Two way stereo speaker system has an unusual shape - speakers have only 12cm in depth, similar to majority of plasma screens. The cabinet is made of MDF covered by leather and melaminated boards with fashionable exotic wood finishes. Thanks to the unusual shape of the cabinet and elegant design, speakers look very attractive in every room and they become unique and tastefull decoration of the interior. 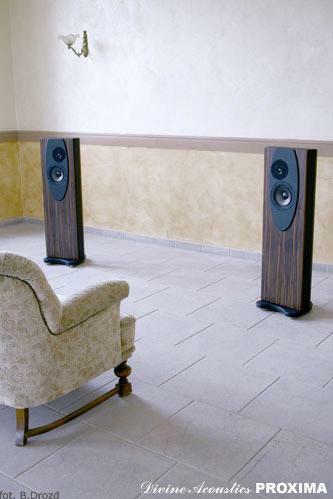 Well - matched parameters of the transducers and crossover elements enable speaker system to sound well in rooms up to 20 square meters of area. Transparency and neutrality of sound, a lot of details, precise soundstage, rhythm, musicality, precise and beautiful vocals - that's PROXIMA. PROXIMA is a closed-box, two way, two transducers speaker system. Over 1m height and 32cm width, it has only 12cm of depth. Slim speaker cabinet gains stability by leather-finished speaker base which is equipped with adjustable spikes. Speaker base is also vibrations absorbing element. It is a multilayer structure - two MDF layers are combined with plastic mass. Leather covering of the speaker base and bottom side of the speakers performs also an absorbing role. The cabinet is built of materials with different dumping factors. Sides of the speakers are made of leather-finished MDF, on a top of each speaker the name PROXIMA is imprinted. Front and back of the speaker is made of melaminated wooden board. There are six different exotic wood finishes available. Connections of cabinet parts are made by using additional HDF elements.